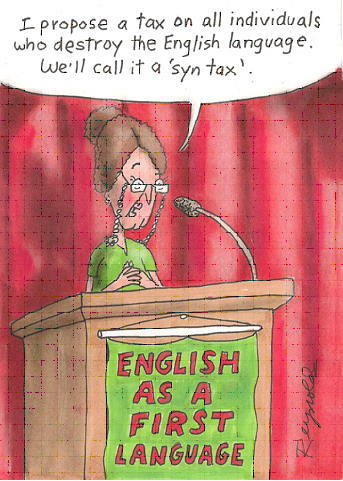 Syntax is a form of grammar. It is concerned primarily with word order in a sentence and with the agreement of words when they are used together. So it is, in a sense, acting as a kind of ‘police officer’ for the way in which sentences are constructed. English is a language that has a structure known as SVO. That is subject, verb and object. The cat (subject) washes (verb) its paw (object). This is the correct word order and also there is agreement between the words. If there were no agreement within the sentence, it could read, “The cat washes their paw”. This does not make sense. The cat may have four paws, but it is only washing one paw. For there to be agreement, the possessive ‘it’ has to be correct. Thus “The cats (plural) wash their (plural) paws (plural)”. This is the correct use of the plural possessive (their). Syntax can seem daunting and it is always difficult initially to understand what a ‘subject’, ‘verb’ or ‘object’ actually is. It can also be difficult to understand whether agreement between the ‘subject’, ‘verb’ or ‘object’ is right or wrong. It is true that syntax can take some time to master, but, once you understand its principles and can apply it without too much effort, then it really is worth the effort, since it will greatly improve your written English. *Syntactically sound but semantically senseless sentence created by Noam Chomsky. At linguistic level (speaker side), human will select, combine, and order suitable words into suitable sentences. Note that words are comprised of syllables and syllables are comprised of phonemes. Then, the ‘state’ move to physiological level (articulatory), which will involve neural and muscular activity, based on the input signal (phoneme) from the previous ‘state’. The muscular activity will form the articulator in a certain shape, so that the vocal tract for a specific phoneme is formed. The ‘state’ moves to acoustic level when there is air flowing through the vocal tract from the lungs. At this level, speech sound wave is generated and then transmitted on the medium of air. When the speech sound wave reaches listener’s ears, the ‘state’ moves to physiological level (auditory). The incoming wave will activates the hearing mechanism, which then involve neural activity in the hearing and perceptual mechanism. The speech chain is completed on the linguistic level (listener Side) when the listener recognizes the words and sentences produced by the speaker. Semantics is the study of meaning. It is a wide subject within the general study of language. An understanding of semantics is essential to the study of language acquisition (how language users acquire a sense of meaning, as speakers and writers, listeners and readers) and of language change (how meanings alter over time). It is important to understand language in social contexts, as these are likely to affect meaning, and understand varieties of English and effects of style. It is thus one of the most fundamental concepts in linguistics. The study of semantics includes the study of how meaning is constructed, interpreted, clarified, obscured, illustrated, simplified negotiated, contradicted and paraphrased. CLICK HERE for more information for further understanding.